The fashion queen Sonam Kapoor is The desi diva as she mostly prefers desi clothes rather than western attire unlike most of Btwon celebrities. Sonam Kapoor rocks the Saree here, there and Everywhere !. The girl doesnt even shy away from wearing the desi 6 yards at the Cannes international Film Festival. Wearing saree at so many events may type cast you and make you look boring but with Sonam and her spicy experiments she comes out looking super hot and hatke every single time. So, how does the diva kapoor do it? She indulges in statement jewellery pieces with sarees, adds layers in the form of jackets, capes or even double pallus, flaunts super contemporary blouses and drapes the saree very in different styles! When most indian women struggle to handle a single pallu Sonam kapoor and her sister rhea came up with the all new double palla style of drape for the saree. The powder blue saree with floral prints and mirror work blouse looked amazing and the styling was on point. This is perfect for winter weddings. Wearing jackets with saree isnt a new thing but sonam went a step ahead and wore an angrakha long jacket with gold saree . This looks very formal but the jewel tones in this look help making it more festive. Sonam is known to step up her style experiments at cannes and at one such red carpet experiment Sonam turned up in a white saree paired with an embellished floor length cape jacket. The Anamika khanna ensemble was a bold contempary twist to traditional saree and was completed off with winged liner and kundan nath. Masaba gupta loves playing with different prints and this lipstick print saree from her can be easily termed bizzare and funky. Soam Carries thiss saree off with effortless ease teaming it with a peter pan collar sleeveless blouse. Sonam Kapoor is not only making waves with her outfits but also with her jewellery choices. This simple saree look can be easily worn by anyone for a breezy festive look which doesnt lack in impact all thanks to the styling. Adding a pair of oxidised jhumkas and necklace is the best way to style up a simple sari for special occasions. The dhoti drape is quiet a rage these days and Sonam was one of the first to be spotted in a dhoti saree. 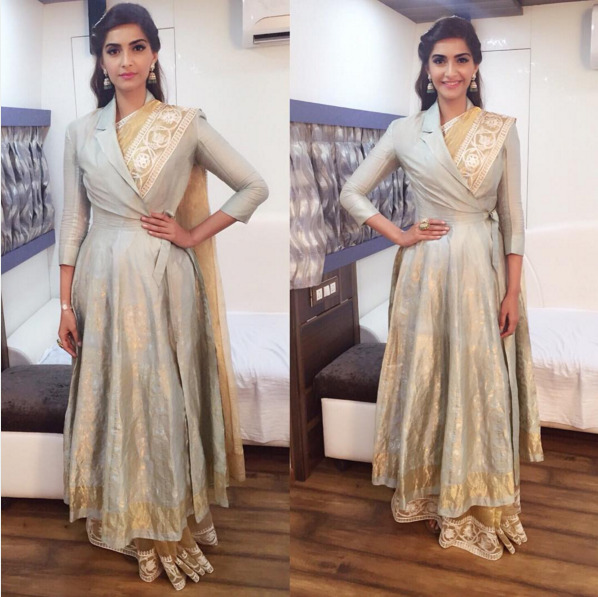 If you want to experiment with your simple saree go the dhoti route like Sonam does. The tissue saree used to be popular in my moms times but Sonam wears it in a refreshing way making people look up and take notice. The pop of green over this pista saree with elegant updo and clutch is stunning. In Masabas Hand print saree Sonam rocked it and upped the glam quotient with this look. A sheer pallu with that kind of blouse can come across looking tacky but sonam manages to wear this look with amazing poise. Wearing a white and red saree where the first pallu was draped normally and the second one went around the neck like most of us drape a dupatta Sonam looked royal. The gajra in hair gives this look a traditional touch. At republic day this year Sonam gave us lessons on how to dress patriotic indian way. Love how she pairs a peplum blouse with a saree and goes minimal on hair, makeup and accessories. This elegant sheer saree look is another epic win from sonam kapoor. The cape trend with a classic updo and a jewel toned clutch is what makes this saree look amazing. The soft makeup is an added bonus. Love. Wearing this Payal singhal saree Sonam Kapoor made heads turn on a TV show. This is a very interesting way to style a plain saree. Add a printed one shouldered blouse, some statement jewellery pieces and a ponytail and you are good to go. Love the whole indo-western vibe this look gives. Attending the bong beauty Bipasha Basu's wedding Sonam kapoor wore a traditional bengali saree with a twist. The offshoulder blouse,oxidised choker and smokey eyes finished this look. I dont like this look much but this is definitely something different and experimental. At sangeet ceremony of Ahana Deol Sonam kapoor looked every bit festive in a white sare with heavily embellished high neck blouse. Silver clutch updo and studs finished out this look. This is how you wear white to a wedding! One of the most popular looks from Cannes red carpet Sonam was spotted in a anamika khanna sare with a sheer cape. I freaking love everything about this look. The choker, the middle parted hair, clutch and makeup all are perfect. At Cannes this year I was disappointed Sonam did not do any saree on red carpet but she did give us a very futuristic saree look at a LOreal interview. This black and blue rimzim Dadu saree has a very hatke texture and stands out anywhere ! This contemporary version of saree worked well for Sonam. Another plain saree look which sonam rocked at the IIJW. Love how the mint saree is paired with pearl jewellery for a traditional apsara like feel. 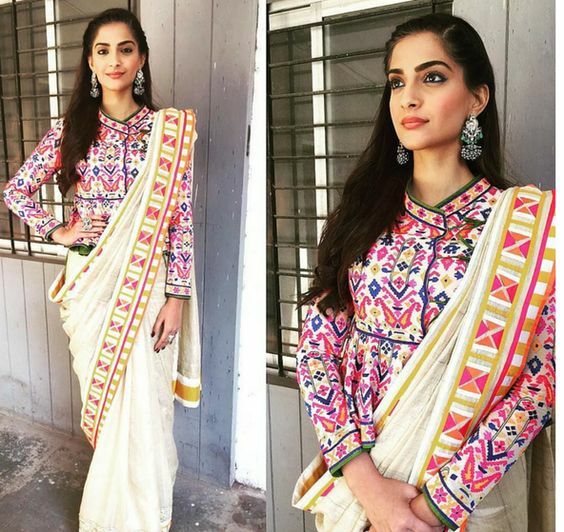 Trust Sonam to spark off trends even in a dull biege Anavila handwoven saree . Taking cue fro the metallic borders of the saree Sonam added Silver jewellery from Amarapalli and crop top as a blouse for a striking ethnic look. The middle parted hair and soft make up finished out this look. 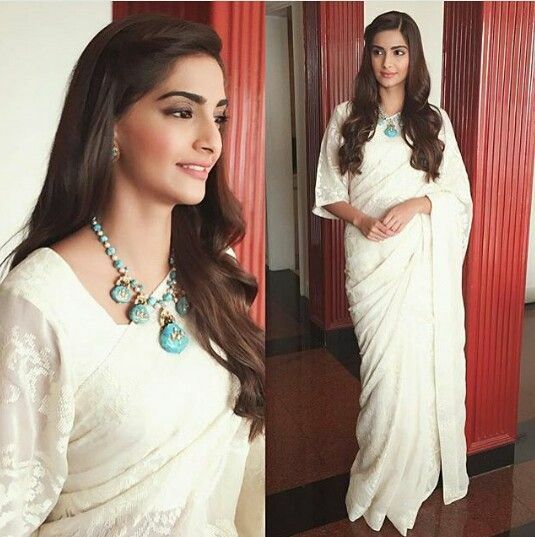 Wearing an all white saree with a white high neck blouse sonam went for Hyderabadi Nizami look . The jewellery from hyderabad with a pop of green shines through on the white canvas. If you want your accessories to be the highlight try something like this. I love how Sonam makes white festive. In this pure white payal pratap saree, styling is top notch with a pop of turquose via the necklace and earrings and soft hairdo . The blouse however could have been better fitted. 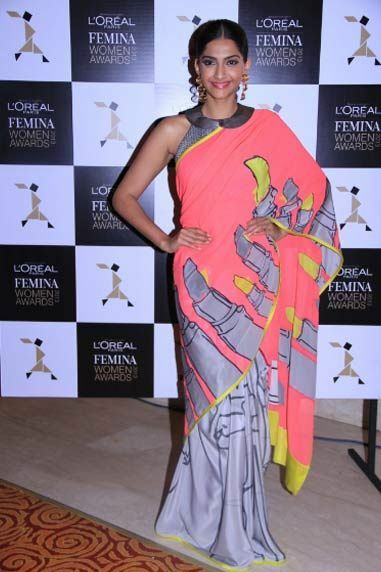 Which Sonam kapoor saree experiment do you love most?